Mindomo 4 Now Available ! We finally did it! The new version of Mindomo is released.It comes with many improvements and innovations. Big thanks to our community, who provided us with feedback and made this release possible. In this release we focused on the following: project and task management, content integration, GUI design and aesthetics and team work. A new offer called “Mindomo Team” was added to our portfolio.Mindomo Team comes to the help of those who work together with their colleagues or clients, and need an easier way of sharing maps, tasks and resources.The Team version comes with a custom subdomain, a common root folder (where other subfolders can be added) and a common user management interface. It also contains all Mindomo Premium features like: upload documents, autocalculate task info, filter tasks and topics, recycle bin functionality and many more. 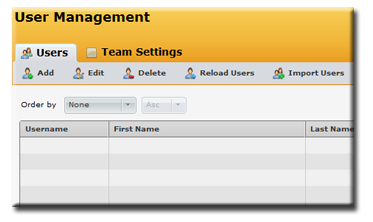 Mindomo Team makes your team work a breeze. When the “Autocalculate task info” is checked on a topic, all topics beneath will be auto calculated from the values of the leaf topics. In order for you to be able to have an overview of the status of your projects, we created the Filtering Functionality which allows you to select topics from multiple maps depending on the criteria defined by you. 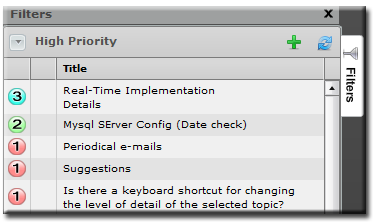 Building a filter for topics is similar to building a filter for e-mails. You can create multiple criteria and specify the logical operator between them. The logical operator can be an “AND” or an “OR”. At this moment the filters are available at your dashboard, but we intend to add this functionality also inside maps. In older versions of Mindomo, once you deleted a map there was no way to restore it (without our intervention). Now all maps deleted first will go to your recycle bin, where they will stay until you will restore or erase them definitively. The maps of the Free Users are also first put into the recycle bin, but in order to restore them, the users will first have to upgrade their accounts. When creating maps, there is a need for adding images which are related to your topic. 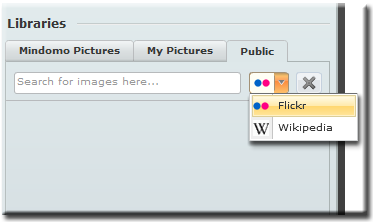 In order to make this easier, we integrated YouTube for searching videos, Flickr and Wikipedia to search images. Searching images on Wikipedia can prove useful because you may actually find an image that represents exactly what you are looking for, as opposed to searching on Flickr, where you have no guarantee that the pictures’ names are relevant to their actual content. The signup process was the most troublesome part of getting started with Mindomo. Many users try to use fake e-mails, which prompted us to implement a fairly complex validation system. The drawback was that this system sometimes would rule out honest users as well.In order to make this process easier, we integrated Google and Yahoo OpenID authentication, which allows new or existing users to sign up with just a few mouse clicks, without validating their emails and going through a time consuming process. In our previous version, we have already integrated a map encryption mechanism. However, in order to maintain a high standard of security, we do not store passwords, so if you lose your password we won’t be able to restore your map. 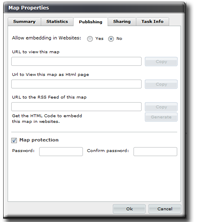 Therefore, in this version we introduced an additional way of protecting maps with a password, but without encrypting it. We also made these protected maps readable with the Mindomo Viewer. Many times you create a topic with several lines and then you realize that these should be subtopics. In order to make this easier, we created the Split and Merge functionalities, which will allow you to split an existing topic into subtopics or to merge subtopics into one single topic. 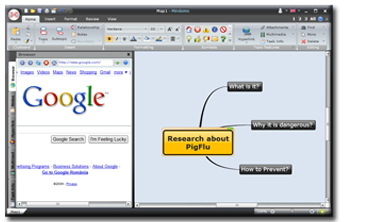 Mind Maps are often used for brainstorming or for doing a research about a certain topic. This process involves searching on the web and getting the results which may be text, image or link into the mind map. With the new browser pane you can go to a search engine (Google, Yahoo, Bing, etc), perform your search, navigate to the search results, and when you found what you were looking for, you can add it directly to your map. You can add text, images or web links. To add them to your map, just right-click with your mouse to show the context menu and then add it to your map. Our designer created a library of new map styles, where colors and fonts are carefully chosen to give you nicer looking maps. We added several new images, in order to make the map creation process smoother and nicer. We reworked the Mindomo Dashboard (the main page after the users logs in). In the new dashboard we highlighted the two most important operations: creating a new map and importing an existing map.We also added there the Topic Filters pane, which we described above. The My Account pages were redesigned to give a nicer and more intuitive look. We hope you like the new release, feedback is always welcome. Mindomo is just enormous software for creating and sharing the minds maps but it has also a limitation about the capacity where it can store only seven private maps at a time or else it is the most excellent software for organizing and increasing the productivity. I am really glad to know that Mindomo 4 has been launched as I am a regular user of Mindomo and it is helpful to organize my work and solving all problems with it. Now, Mindomo 4 enables to add task information to map topics, including task priority, percentage complete, start and end dates, task duration and other useful resources. Another thing I like the most is Recycle Bin as now it is easy to restore my deleted data. Hi! It's a little strange to have the Autocalculate getting de “max” duration of child tasks; if each task will have its own time, the logical would be the parent task to have all the durations sumed instead of maxed. Isn't it possible?